While the Xbox One was already granted its own Fanatec steering wheel in 2015, Playstation 4 owners had to wait one more year to have a taste at a higher-end wheel. Since 2016, the German manufacturer has finally proposed a version of the CSL Elite which is officially compatible with Sony's console. For our first full-written review of 2017, we have decided to give you our detailed impressions on this (quite expensive) piece of hardware, with a bunch of off-screen videos showing the wheel in action and even a fully translated video review. Because it's a first on Gamersyde, we would love to hear what you think about this kind of article so we know if this review was well worth the efforts we've put into it. Enjoy! Note: Many thanks to Tiz, who helped me make sure the translation was solid enough to share it with you. Fanatec and Gamersyde, a long story that goes a long way, back to when we were looking for a versatile steering wheel that would work on Xbox 360, Playstation 3 and PC. At the time, the Logitech G25 was king in its domain but sadly, it was not compatible with Microsoft's console. Needless to say that investing in a device which would be limited in its use was not particularly motivating. Fortunately, German manufacturer Fanatec had already shown some expertise and their reputation was solid. While it was true that the finishing touch on their wheels was not always as glossy as that of similar devices, the quality of the materials and fabrics showed great skills in terms of workmanship, especially compared with the poorly designed official wheel by Microsoft (which we have owned for a while by the way). By producing a multi-platform version of the Porsche 911 Turbo S, Fanatec was obviously aiming at car enthusiasts who were willing to spend a bit more money, though to be fair, the prices were far from being over-exaggerated. The bundle included a very well-made steering wheel, a set of plastic pedals with a brake that offered a welcome resistance, and two shifters (an H-shifter and a sequential one), which were quite noisy but also strong enough to withstand the worst abuse for a few years. We never regretted our purchase, the wheel featuring a LED display of the different buttons which allowed to go from one console to another by showing the right symbols or letters (cross, square, triangle and round on PS3 and A, B, X and Y on Xbox 360). Incidentally, we also bought the Fanatec wheelstand to play more comfortably. A few years later, we put our money down a second time to buy the first version of the Fanatec Clubsport pedals. Made of metal, the pedals featured a pretty neat ABS vibration option for games that implemented that functionality. Equally satisfied with our new investment, there was no way we could go back to playing with a gamepad and, though our skills were not always as good as we wanted, the hardware we owned was never to blame. Our latest purchase to date on the Fanatec website dates back to 2015, with their first Clubsport shifter, which finally allowed us to completely free ourselves from the noise of the original plastic shifters we had been using until then. Once again, the product was of excellent quality, sturdy and pleasant to handle, with a seventh gear that was unfortunately not compatible with the wheelbase we had - which was starting to show its age. On PC, it was fortunately possible to get around the problem by connecting the shifter to a USB port, in games that allowed multiple USB inputs of course. Unfortunately, the old age of our Porsche 911 Turbo S was soon to be confirmed, with the impossibility to use it on PS4 and Xbox One to begin with, but also because some studios stopped supporting it in their games on PC. We then had to go back to using our good old controller and as months went by, we eventually almost forgot how important a good steering wheel was in terms of immersion. Thankfully, Fanatec kindly agreed to send us the CSL Elite for Playstation 4 and PC for review, along with an Xbox One wheel rim to make the wheelbase compatible with Microsoft's console. The first thing that struck us when we started to look for a new Fanatec wheel was that, in almost a decade, the prices of the German brand have increased significantly, which is mainly due to the better quality of the materials used. In 2009, a multi-platform steering wheel bundle with the included pedals (accelerator/brake/clutch), 2 shifters (not counting the 2 paddles) cost a whopping €340. Today, things have changed a little to say the least. The CSL Elite for PS4 and PC is indeed available at €519.95, with a modular pedal set that offers only two pedals (an individual kit is available to add one for €139.95). To be able to make the wheelbase compatible with your Xbox One, you will have to add the price of a wheel rim (€99.95), or even the one which was sent to us (€179.95), for a total of either €759.85 or €839.85 - not to mention the price of the wheelstand you may need if you cannot mount your steering wheel to a table or a desk. It's a significant investment of course, but it is still more interesting than buying two wheels from the same quality range for you to be able to play on your PS4 and Xbox One. Quite obviously, the guys at Fanatec's are now targeting wealthier players, even with their most affordable products - the German manufacturer also sells wheelbases, wheel rims, pedals, etc. that are definitely more expensive than the starter kit we received. The sim racing market having become much more important today, it is not a surprise to see such a rise, and given the overall quality of the equipment, the prices do not seem exaggerated to us. Let us tell you why in the next paragraph. To our surprise, we received no less than four different parcels about 2 months ago. In the first one, we found the steering wheel itself (the wheelbase and PS4 wheel rim, with its realistic diameter of 30 cm), as well as exchangeable button caps with automobile symbols (handbrake, lights, windshield wipers, seat adjustment, etc. .) or other types of pictograms (arrows, +/- buttons, numbers). The box also included an additional PS4 button set, in case you ever want to purchase a Clubsport wheel in the future. These plastic buttons are interchangeable, but the operation can be a bit tricky as doing it carelessly risks damaging those you are trying to remove, or even the brushed aluminum front plate of the rim. That being said, such a customization option is a very good thing for those who plan on investing in several wheels dedicated to different sorts of motorsports, or those who simply want their setup to look like more like the real thing. The quality of the plastic used for the different buttons is good enough, so you won't feel uncomfortable using them. The bundle also includes a table clamp to properly secure the steering wheel if you do not have a cockpit or a wheelstand. The PS4 version of the CSL Elite is composed of suede fabric with blue stitching (which looks very nice) and micro-perforated genuine leather (which feels great), while the Xbox One wheel rim we were sent (same diameter) is made of suede only (with red stitching this time). During the period of the review, the two rims seemed to hold up pretty well, with no signs of wear, which tends to confirm our first impressions on the quality of materials used. The brushed aluminum front plates of the 2 wheel rims we received gives them a pretty classy look. Both wheel rims also include a digital display that can be used to show the gear engaged or the speed of the car, depending on the game (note that some do not incorporate any of those features). We should also stress the nice effort which was put in the aluminum paddles, which are clearly several leagues higher than those of our old Porsche 911 Turbo S. They feel much more realistic, with the click sound one can expect to hear when using them, but most of all, they are very easy to reach as they are long enough to be accessible when driving. Each rim obviously incorporates the button "guide" of each manufacturer, so returning to the dashboard of the console is really quick and handy. A small joystick also allows to navigate naturally in the menus, which adds a lot to the overall ergonomics. 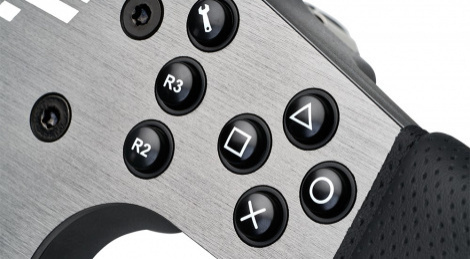 All the buttons of the 2 official controllers are there too, even the Share function on PS4. One last button gives access to the internal settings of the steering wheel where, just like with the Turbo S, it is possible to save 5 distinct presets. Here, you can change the turning circle of the wheel, the power of the force feedback and vibrations, the triggering of the vibrations of the ABS (when the game is compatible - and you own the Clubsport pedals), the drift mode (to make the steering wheel more flexible as there are several values to choose from), but also the braking amplitude (one can for example decide not to have to push the pedal to the maximum to reach 100%). A new parameter was also added last summer, the FEi (Force Effect Intensity), giving the possibility of minimizing the mechanical noise of the steering wheel when force feedback is activated. Now let's talk about the wheelbase itself, to which you can add any compatible rim very quickly. Please note that it is not possible to detach the rim in place without using the Allen key provided, as there is no quick release system included here. Aside from this small detail, changing rims is very simple and requires a few seconds, so that you should never be too reluctant to switch from one console to another. The overall design of the wheelbase is also quite convincing, with a brushed aluminum front plate similar to that of the rim, the Fanatec logo being proudly stamped on its left in white letters. The base has a power button that is better integrated than the one of our 2009 Turbo S, which gives the wheelbase a more professional touch. On the top of the base, Fanatec added a rev light bar which can simulate the rev counter in games / systems that allow it. Under the start button is another very important feature of the wheel, since it allows to switch modes to make the wheel compatible with the device to which it is connected. On PS4, the LED light can be either blue or purple. In blue, the steering wheel is in PS4 mode, which means it will work with all games that include the CSL Elite in their list of supported steering wheels. That's not all though as Fanatec also added a compatibility mode, which when activated changes the LED light to purple. In this mode, it becomes possible to enjoy the device on most titles that do not officially support the wheel. For example, DriveClub is fully playable with the CSL Elite, thanks to the latest firmware update as is Gran Turismo Sport. Developer Polyphony Digital still has not included any Fanatec wheels in the game, fortunately, the compatibility mode works perfectly and really takes advantage of the strengths of the steering wheel. We don't know exactly how Fanatec proceeded to make this possible, but what is certain is that the option is a true blessing. Regarding the 2 other systems finally, in PC mode, the LED light turns red while on Xbox One it becomes green to confirm the support of the steering wheel by the console. A big noise to expect? One of the main concerns for anyone considering the purchase of a steering wheel is undoubtedly the amount of noise it can produce in action. Beyond the inevitable noise of the force feedback and vibrations - which can be tuned with the new FEi function integrated into the steering wheel or by lowering the level of vibrations in the game itself, you might wonder how loud the ventilation system can get when the wheel is being used. It is always quite difficult to discuss this particular subject as the opinion can vary from one person to another. In all objectivity, when the fans start to regulate the temperature of the device, we can hear them quite clearly, but never to the point of completely covering the sound effects of the game you're playing (even less so as PS4 and PC can be a lot noisier). If you are a regular user of headphones, you will obviously not be bothered, but some may want to turn the volume up a bit when playing with the sound coming out of their home theater system. That being said, even when using our Onkyo receiver, we cannot say that we were ever bothered by the noise caused by the fans of the steering wheel. They are not at full speed all the time, so despite noticeable noise, we did not find the CSL Elite to be more annoying than the other similar devices we've tried so far. Equally important for the potential buyer is the system included to attach the steering wheel to a table. In all honesty, it is functional, but clearly less effective than hard mounting the device on a wheelstand or a cockpit. Hard mounting the base will require you to remove two large plastic blocks located under it - be aware that the Allen key necessary to do so is not provided in the bundle. Let's not forget to mention that Fanatec steering wheels must always be connected to the console (or PC) with a USB cable, but also plugged into a wall socket (via the pretty large external power supply). Accustomed as we were to the first Clubsport pedals released by Fanatec several years ago (the current version is now called v3), we were somewhat wary at the prospect of ​​discovering the CSL Elite pedal set. Mixing a majority of metal elements (aluminum) and some plastic parts, the finishing touch is superior in every way to the pedals included in our 911 Turbo S bundle back in 2009, but the idea of ​​moving from the clubsport design to the one below was not too appealing to us. Before giving you our verdict on the overall quality of the CSL Elite pedals, let's first start with a quick description of the content of the bundle itself. With only two pedals (brake and accelerator), it requires a few minutes of assembly work, that is to say you will have to screw the two pedals onto their base. Interestingly enough, the player is left totally free when it comes to choosing the distance between them, although this customization option especially comes in handy when adding a third pedal. Basically, the default brake pedal lacks a bit of resistance, which is no wonder since this pedal becomes the clutch when you invest in the Loadcell Kit. This aforementioned kit includes a brake pedal which is much firmer than the original one, and above all, it is fully customizable. Several sets of elastomer springs of different resistance (up to 90kg) are included in the package, allowing you to choose precisely the stiffness of the brake. Five of these small elastomer cylinders must be placed on the pedal rod, with the possibility to combine springs of different resistance to get exactly what you want. It does not seem like much of a big deal, but this flexibility of the installation, which can be done in a few seconds once the pedals are fixed to the stand is a significant feature in our opinion. For the price though, you should not expect this pedal set to take advantage of the ABS vibrations, as they are reserved for the Clubsport version only - which comes at a much higher price. The box still contains two types of pads for the pedals to offer a bit more customization. The default ones are made of rubber, but it is also possible to choose pads which offer more grip. Let us also mention that the RJ12 connectors of our old Turbo S wheel have replaced the PS/2 ports of our former Fanatec steering wheel and our Clubsport V1 pedal set. It should be noted that the CSL Elite is built with some elements of the Clusport version, so as to provide the best possible FFB experience. The steering wheel is based on a brushless servo motor with a single belt drive, bringing greater flexibility and allowing much more nuances in your driving. Beware though, this model is not Direct Drive. We will detail our impressions on every game game we tried with the CSL Elite in a few moments, but to give you more general feedback regarding the wheel, the smoothness with which the wheel turns brings a lot more comfort than the Logitech wheels we used to have. The power of the force feedback, capable of developing up to 6Nm of torque, is largely sufficient for normal use, and it it is not uncommon to be obliged to reduce it slightly (via the game or the steering wheel) to avoid tiring one's arms. The size of the rim (30cm) is perfectly suited for long sessions, and provided you are properly installed and the game is correctly calibrated, you will not realize how long you've been playing when it's time to stop. Despite our first mixed impressions on the pedal set, and more precisely the original brake pedal, the one included in the Loadcell Kit proved more accurate than we thought. After a few moderately convincing first hours, the brake pedal of the Loadcell Kit finally managed to prove very effective, almost as if it had to go through a short trial period before revealing its full potential. We still prefer our good old Clubsport v1 set though, both because of the materials used and the sensations it provides, but for a cheaper price, the CSL Elite pedals and the Loadcell Kit are worth investing in. Of all the games we could try with the CSL Elite on Playstation 4 Pro, it is undoubtedly the least conclusive. Unlike DiRT 4, which transcribes the bumpy surfaces with the expected subtlety, while giving enough information to the pilot so that it always remains possible to anticipate the loss of grip, Kylotonn's title is clearly lacking when it comes to overall feedback. There is, however, a myriad of settings to meddle with in the in-game menu, but we have never truly been able to find a totally satisfying result. WRC 7 is still fun with a wheel though, and actually more demanding than with a controller, but the game lacks the precision that you'd normally get with the CSL Elite. Evidently, the problem isn't due to the wheel itself but to the way FFB was implemented in the game. It is obviously possible to turn to the internal settings of the wheel, which allow to tweak things a bit more to match the requirements of the player, but there is only so much you can do to fix something when the game is to blame. With some efforts, we finally got an acceptable compromise, but still far from the good impressions we had during Gamescom on PC. Without necessarily having to go through some tedious tweaking in the option menu, the responsiveness of the CSL Elite is rather good from the get-go. Whether you drive on asphalt or loose surfaces, Codemasters' title manages to convey the sensations that one is entitled to expect from a rally game. The driving is more demanding than in WRC 7, hence the necessity to go easier on the brakes – unless you want your car to take you for a spin at every corner. Fortunately, the way force feedback and vibrations have been implemented should allow you to react properly when the car loses grip, provided you are reactive enough of course. The only small downside may be how hard it is to turn the wheel by default, which will probably force you to meddle with the settings of the game and/or the steering wheel. Our overall impressions are very positive though, with much more immersion than with a gamepad. There is something you must keep in mind however: rally games require some real practice on the different stages and surfaces, not to mention the various cars, before being able to make the best use of a steering wheel. The very good surprise of this series of tests came with Slightly Mad Studios' game, which often suffers from a certain lack of precision with a gamepad. Thanks to Fanatec's CSL Elite, this sequel takes on a new dimension. The settings available in the game are varied enough to find the right compromise, and there are actually 3 distinct presets to choose from, with a detailed explanation of what each of them do. By using the raw setting, the force feedback is powerful enough and the movements of the steering wheel remain smooth and flexible. Contrary to a gamepad, which can often be stingy when it comes to feedback, it is possible to feel the various asperities of the road and the loss of grip. As a logical consequence, it becomes much easier to correct mistakes and avoid going off track. On the rallycross circuits, our impressions are just as good, with the constant vibrations of the steering wheel able to mimic the bumpy surfaces, allowing to feel the change when arriving on asphalt. Similarly, the jolts of the road and the times when the rear of the car starts drifting are easily perceptible thanks to the good implementation of the FFB. This is a game we advise everyone to play with a good steering wheel, the CSL Elite Fanatec being an excellent choice if your budget allows it. Although we can't say we're particularly used to driving Formula One cars, we still launched Codemasters' latest installment in the F1 series with the CSL Elite to see how it played. Because F1 cars are much more responsive than other racing cars, we first had to get used to the sensitive steering and especially effective brakes, which took a little bit of a while. Similarly, the presence of eight gears was a bit hard when we had to apprehend our first corners, because we simply didn't exactly know which gear to use and when. With the circular rim that we received, we may also have lost a little immersion, but it remains possible to invest in one that is better suited to Formula 1 cars. Despite all that, playing F1 2017 with the CSL Elite proved much more fun than with a gamepad. Since Evolution Studio was shut down in March 2016, only the German manufacturer could make its device compatible with the game. Playable with the CSL Elite thanks to the compatibility mode, DriveClub provides an undeniably arcade experience, without necessarily forcing the player to go through the wheel settings. Even after turning off the steering assists, the handling remains really accessible with a steering wheel that responds well and does not lack precision. This newly-added compatibility is without a doubt a nice little bonus for those who thought they would never be able to play DriveClub with a more recent wheel. Fanatec's work on the compatibility mode is therefore an excellent thing, both for older titles and more recent ones, which do not yet include the CSL Elite in their list of supported devices. And this is precisely the case of the next game we are going to talk about now. As we all know, Polyphony Digital's title is still far from offering the content we'd hope for such a big franchise, even though it's bound to be regularly updated to make it more and more appealing - as proven by the arrival of a real career mode 2 weeks ago. Well, the same goes for its list of officially supported wheels, which is also quite limited for the time being. When GT Sport came out, Fanatec announced that the Japanese studio hadn't had the time to add the CSL Elite, but that it would certainly be the case in the near future. Sadly, as far as we know, nothing has changed in this respect, and we must content ourselves with the few Thrustmaster and Logitech wheels proposed in the option menu. Fortunately, players can count on the compatibility mode of the CSL Elite. While we obviously cannot compare the implementation of an officially supported steering wheel with one that only works in compatibility mode, we can confirm that the sensations are excellent with the CSL Elite. A quick passage in the in-game settings is necessary to soften the steering a little, but then you get a very realistic and natural behavior of the wheel, both on asphalt and dirt. In fact, the big added value of a steering wheel in GT Sport is the renewed interest in the rally races. While the sensations with a gamepad were rather bad, with a sort of bad Ridge Racer vibe and no real feedback from the track, they become much more realistic and interesting behind a good steering wheel. We will even go so far as to say that the wheel feedback on dirt proves more satisfactory than in one of the rally games we mentioned above. On asphalt, the precision is perfect, with logical and realistic info coming from the wheel. Playing the game with the CSL Elite has then left us very enthusiastic, which makes GT Sport the place to be whether you own a wheel or a controller. Despite being the number one game for all Xbox One owners who love sim racing, Turn 10's game still requires to spend a bit of time in the steering wheel settings menu before being enjoyed to the fullest. Basically, the original stiffness of the wheel made each lap unnecessarily stressful and tiring, but once we managed to understand the point of each of the many parameters available to tweak the controls, it felt exactly like driving a race car. We also tested different configurations on the steering wheel itself, notably by reducing the power of the force feedback, and this additional flexibility is undeniably a plus, especially since it is not necessary to use external software (the digital display on the wheel allows to easily navigate between the different options and change them on the fly). On the Nordschleife, our favorite circuit in many respects, it's a real pleasure to complete several laps in a row, which we never really manage to do for a very long time when playing with a gamepad. The steering wheel makes it much more natural to drive and it adds a significant level of immersion, so that you suddenly realize why it is so important to purchase a wheel - when you have the room and money to do so. Forza Motorsport 7 may be excellent with a standard controller, but it takes on another dimension once behind the CSL Elite wheel. Like all the devices of its kind though, you must remember that it will not always necessarily be “plug and play” in the sense that it will sometimes necessitate to find the proper settings before being able to shine on the circuits. Recognized immediately when launching the game, the CSL Elite is apparently compatible with Forza Horizon 3, which is not a surprise since it shares some of its DNA with the Motorsport series. That being said, we found the handling to be particularly delicate on dirt roads, especially when compared to how the game plays with a controller. While driving the Australian roads at more than 300km per hour is a piece of cake, it becomes much more difficult to control your vehicle on the dirt trails of the map. The car has a clear tendency to spin around because accelerating in first and second gear is way too sensitive and unforgiving. There is most certainly a way to tune the settings to make the game more playable, but we haven't had time to find a satisfactory set-up yet. Surprisingly, the behavior of the CSL Elite steering wheel proved to be quite different on Xbox One for these two titles. With a rim which is much more difficult to turn with the default settings, some parameters must be changed in the option menu of the 2 games to get proper control of the vehicle. Once again, it is truly with Project CARS 2 that the sensations have been the most convincing so far. Indeed, once the right settings have been found, the driving pleasure is undeniable with a wheel. In Project CARS 2, you really feel like you're in control of your vehicle and the combination of good FFB and vibrations makes it easier to read the track. It is unfortunately far from being the case in WRC 7. Just like on PS4, modifying a certain number of parameters in Kylotonn's game can improve the driving sensations quite dramatically, but the lack of vibrations on gravel or dirt is still a real shame. It is however possible to have some fun playing, though this rally game is clearly not essential to Xbox One steering wheel owners in our opinion. While it may seem incongruous to talk about Slightly Mad Studios' game for the third time, it is actually quite interesting to take a closer look at this version of the game to see how it handles force feedback. Indeed, without knowing exactly why, with the exact same driving aids and the same vehicle, we found that it was much easier to lose control of the car on PC than on the 2 consoles. For example, downshifting directly from fourth to second gear with our H-shifter posed no problem during our sessions on Xbox One, while on PC, the risk of losing grip was particularly high. This is obviously not a flaw, as driving requires more subtlety and attention this way, something sim racers are bound to appreciate. Anyway, once again, Project CARS 2 proved to us that players can benefit tremendously from using a wheel. As disappointed as we were in the game on PS4 and Xbox One, we were still hopeful to find the same amount of fun we had with the PC version during Gamescom. Sure enough, playing WRC 7 with the CSL Elite on PC turned out to be a completely different story. There is no doubt that the 60 frames per second framerate had something to do with it, the added accuracy in the controls being quite obvious right from the start. The difference with the 2 console versions does not end here however. Indeed, the implementation of the steering wheel itself is radically different. Vibrations are for example much more present, which makes it possible to truly feel the changes in surfaces. Moreover, the slightest bumps, the tricky sides of the road and the jumps/landings are much better transcribed than on consoles, so that it makes the whole experience much more realistic. However, we advise you not to push the vibrations to the maximum in the option menu, as the steering wheel can get a little too noisy. In addition to the added friction feedback, this PC version conveys surface changes much more effectively. Arriving on asphalt is felt immediately in the wheel, with less noticeable vibrations making the road feel smoother. To sum up, this PC version of WRC 7 finally allowed us to confirm the good impressions we felt with a wheel when playing the preview build in Cologne back in August. It has also proved to us that the differences between consoles and PC are not always limited to graphics or framerate. Unlike its little brother, DIRT Rally does not officially support the CSL Elite. Fortunately, it is possible to add the steering wheel manually by binding the rim, the different buttons and the pedals. FFB could probably be a bit stronger, especially after pushing most in-game sliders to the max, but overall the game responds pretty well once the set-up has been completed – just don't change the pause button as for some reason, it prevents the game from saving the personalized device onto your profile. Our Clubsport H-shifter was easily recognized, as well as the pedals, and once the set-up of the wheel was complete, the steering precision was just perfect. Each stage obviously requires a good amount of training to achieve a good performance, but the added comfort of the steering wheel is once again undeniable. Incidentally, we still find this episode of the DiRT series to be more interesting to play (and even better looking overall) than the fourth opus. The presence of 6 countries for the standard stages, as well as Pikes Peak and the rallycross tracks also make this game much more indispensable to us than its successor. Being officially supported by the game, the CSL Elite brings more sensations here in terms of vibrations and force feedback than in DiRT Rally, even if we think its stages are a lot less interesting. Just like with some other titles, do not hesitate to spend a little time in the settings to find the right balance between flexibility and accurate feedback, because once it is done, driving through the different stages will feel pretty natural - provided the narrowness of some of the roads do not intimidate you too much. As always, rally games require an even greater investment than others to be fully enjoyed, and DiRT 4 is no exception to the rule, but it's absolutely worth it. While its content is probably less flashy than its best-known competitors, it is now much more solid thanks to the many DLCs made available since the release of the game (including a free one 2 weeks ago). True, its menus and overall presentation are quite austere to say the least, but Kunos Simulazioni's title shines where it truly matters: on the track. Thanks to its impressive engine sounds and its incredibly realistic physics engine, the game does not have anything to prove to the likes of Forza Motorsport or Gran Turismo. Our experience with the game and the CSL Elite has been excellent in every possible department, and we didn't even have to modify anything in the option menu of the game when we first launched it. Force feedback is perfectly integrated, the various contacts between the tires and the track - or between the car and the barriers - always send the right information to the pilot, which greatly contributes to the immersion and the improvement of his/her skills. Considering the fact that the modding community is particularly active, with the creation or reproduction of many rally stages for example, it would be criminal for anyone owning a CSL Elite (or any other wheel for that matter) to miss Assetto Corsa. A must-have! We won't be talking about Wreckfest much, as the game is still in development and therefore far from offering a finalized experience – as proven by the impossibility to save the binding of the keys of our steering wheel, forcing us to do it all over again every time we went back in the menu. As you can imagine, this made us lose quite a huge amount of time - not to mention our nerves. Apart from that, the game does not propose enough force feedback and vibration options to tweak the wheel. As a result, the implementation of the steering wheel leaves much to be desired for now, making counter-steering too random, with a lack of precision in the steering that makes every contact with the other cars all the more frustrating. However, this is in no way a final verdict, the current version of the game still being in pre-alpha state. We do hope, however, that the developers will add official support for the CSL Elite, because there are too few arcade games of this kind today. Let's finish this little overview of our PC game library with two titles from the Microsoft catalog, which are unfortunately not fully compatible with the CSL Elite for PS4 on PC. First of all, Turn 10's game does not react to the presence of the steering wheel when in PC mode, which means all you can do is use the keyboard to play. After doing a bit of research, it seems that the Xbox One version of the wheel works properly on PC, which leads us to think that despite the addition of the Xbox One rim, the base of the steering wheel is not fully recognized. Needless to say that this little setback disappointed us, but the fault probably lies more with Microsoft and the studio than Fanatec. Oddly enough, our contact at Fanatec told us it was working well on their end. We tried again, switching back to the PS4 rim to make sure, but it was still impossible to use the wheel with the game. Then we found a post in a thread on the Forza Motorsport 7 forums. Some guy explained he had managed to use the wheel by pressing the mode button for 5 seconds, which apparently forces the Xbox One mode, something that appears nowhere in the wheel's instruction manual. We launched the game again after that and sure enough, it suddenly worked fine with the wheel. On the one had, we're quite happy to have found a workaround to play the PC version of Forza 7 with the CSL Elite for PS4, but on the other hand, it would be nice to see the release of a fix - since we are not the only ones struggling with the wheel and Forza 7 on PC. The situation is a little different when it comes to Forza Horizon 3, since the steering wheel is actually taken into account by the game, despite the lack of official support. Thus, once in the option menu, the CSL Elite is nowhere to be found in the list of supported Fanatec wheels. Nonetheless, it is still possible to use it to play Forza Horizon 3. Using the default settings, the result is however far from being conclusive, even on asphalt roads where the movements of the steering wheel seemed quite incoherent and exaggerated to us. Maybe tweaking the settings can improve the handling so it can at least get closer to the experience we had with it on Xbox One, but the rental period of the wheel was coming to an end and we didn't have time to find something more satisfying. Obviously, the best thing would be to get a future patch including this newer version of the CSL Elite. It is a bit unlikely however, since nothing has been done so far. We are not going to act surprised, with the CSL Elite for PS4, Fanatec has brought to the market a steering wheel of great quality, both in its overall design and in the sensations it provides with the various games we could try. Some will argue that the price tag still remains a major obstacle, but for sim racers who spend most of their playing time behind a wheel, there is no doubt that such a purchase will quickly pay off. One can certainly wonder about the future of compatibility of the wheel with the new consoles that will inevitably show up sooner or later, but for now, provided you have the necessary funds to buy it, this wheel compatible with 3 different systems is undoubtedly the ideal solution for those who have never sworn allegiance to a particular manufacturer. With its strong force feedback, its multiple settings and its evolutionary aspect (with the purchase of new rims / pedals / shifters and the possible addition of a future handbrake, etc. ), the CSL Elite has been designed to please, if you can afford it. Note: Hopefully, you'll be comprehensive when watching the video review as the voice over work had to be done in one single take (which is a lot harder than it looks). Thanks for the review. Impressive driving! Now the funny thing about games is that they can sometimes be more demanding than the real thing. I remember a professional rally driver told Kylotonn (the WRC series since the 5th installment) that braking was not efficient enough in their game, but they didn't want to change the default settings because players were going to complaint it was too arcady. So basically, all I can do is compare how each game and driving wheel feel. At the end of the day, unless you have the money to invest in a hydraulic cockpit, you can never truly feel the car movements anyway. It's in the review but I'd recommend having the costs and links to purchase also at the top (under main image) or bottom of the review. I don't really play racing games nor have I ever tried a wheel set-up but after watching the vids and reading of the feedback it can give makes me want to get one sometime. How does the H-Shifter operate in games that use the clutch pedal? Are you prevented from moving it unless the pedal is depressed? Another thing with gameplay-footage is that I rarely get a sense of speed but in these they look fast. Maybe because wheel & player in view, off-screen capture, camera angle? Not sure. Talking of camera angle, it was positioned very nicely: can see gameplay, can see wheel & stick, can see player action, can see a bit of the pedal work (would have liked to have seen a little more but understand it could be tricky to get it all in & also you're not a site dedicated to racing sim vids). Can see a little blond head :) - tell them hi! Thanks for the work & effort, and thanks Fanatec for the wheel! When you activate the clutch in a game, usually you can still switch gears if you don't use the pedal but it can eventually damage the engine or changing gear will be slower. It depends on the game. There might even be games in which not using the clutch makes it impossible to gear up or down, I don't remember if I've seen that in a game to be honest. Now when it comes to the H-shifter itself, not using the clutch pedal cannot prevent you from moving it. How did you capture the audio? I thought it was direct-feed at first but at the end of CSL Elite (GT Sport/Race #1) I assume the noise is from the wheel (with it visibly rotating and all). The audio is direct feed indeed. While I was filming with the camera I was also recording direct feed gameplay. Then I just took the audio from the direct feed footage and added it to the off-screen one. So no, you can't hear the wheel in the videos. The game / something to do with the capture? I'll check asap and will let you know. Anyway I'll wait - so no rush. Detailed review, good job Driftwood!